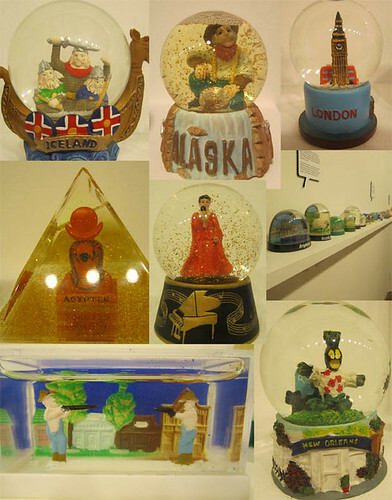 It all started with a trip to The Museum of the Modern Snowglobe. Yes this is a real place, with an actual physical location. You visit by appointment and get to take a look at some of the wonderful and weird curated lovelies donated by travelers and displayed on a long shelf circling the display room. Do not miss the Hatfield and McCoy snowglobe (see bottom left) or the Liberace snowglobe (center square!). The snowglobes exhibited rotate, so perhaps you will want to go back more than once! We left with a fever for these tchotchkes and plans to make some globes of our own. Well that was 2 years ago now. Time flies when you are doing things, and sometimes other things you meant to do get pushed to the wayside. 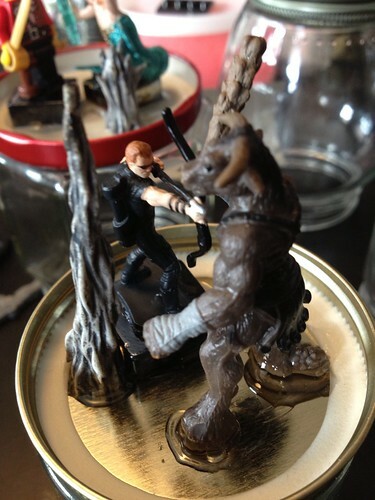 Sometimes you start saving jars and little figures and start to wonder if you are showing weird hoarder tendencies. Sometimes you go ask for glycerin at a pharmacy and are full on shocked by the product you are handed (pro tip: if you want liquid glycerin, just get it online and save yourself a lot of embarrassment). But I digress. 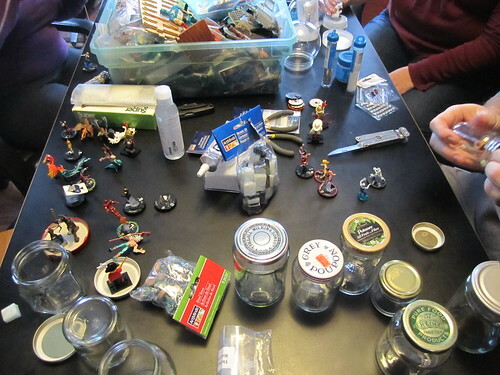 A crafternoon was planned and snow globes were finally made. As the above picture shows, we had a lot of stuff. Along with the above listed items, I had picked up a bag of tiles to help raise up the figures. I recommend this, especially if you are using small figures. It keeps your figure from being hidden by the lid part of the jar. Also, the always generous Mr. Menace, who has been designated patron of Crafternoon for his uncanny ability to always produce what is needed, (he's a one man room of requirement, he is!) gave us access to his crate of odds and ends. 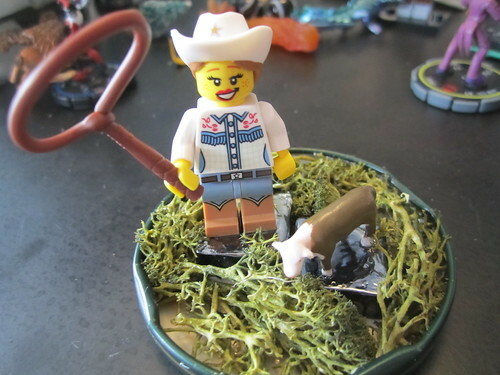 So many tiny weapons, and accessories (including a fez!!!)! As I said, let your scenes cure for at least 24 hours. This is mas serious, or else your figures may not hold up to the shaking. Ok, that done you are now ready to fill your jars. Try as I might, it was not possible for me to do these without getting some air bubbles, but, such is life. What I did find is that when you start filling the jars it's best to go in the order of glitter, distilled water, glycerin. The amount of glycerin is really dependent on your jar type. 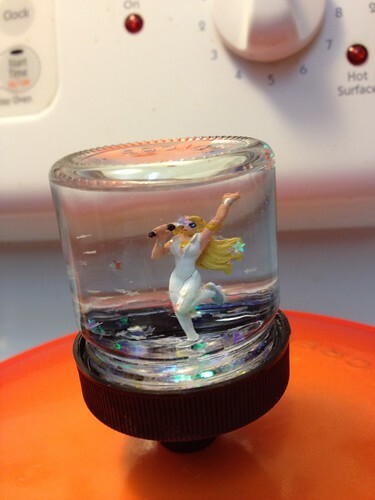 The nice thing is that you can easily screw on the jar lid and give a test shake to be sure you are happy with your glitter distribution before you seal things up. If you aren't happy, dump it out and try again. I love a forgiving craft. 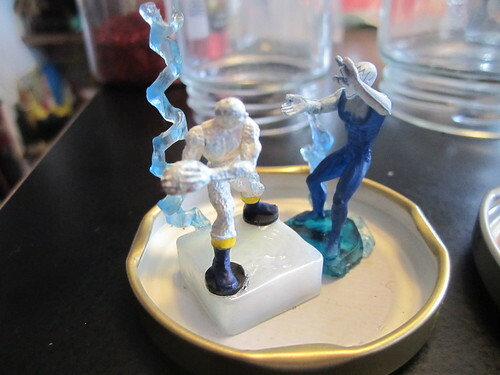 A Dazzler Heroclix in a small spice jar. 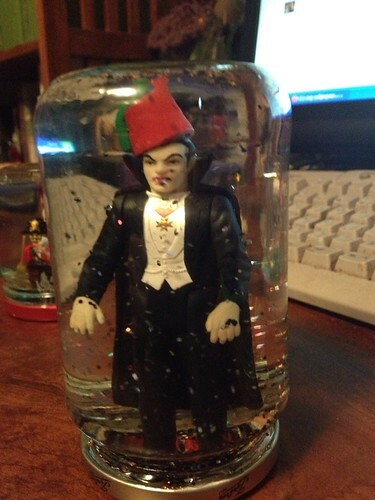 Dracula in the aforementioned fez. I have to say, this Iron Man one is my favorite. It just came together perfectly. 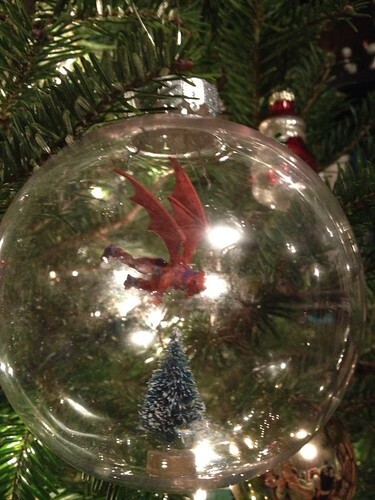 Now, as amazing as these are, The Red Menace also did a tandem craft along with her snowglobes...Christmas ornaments! 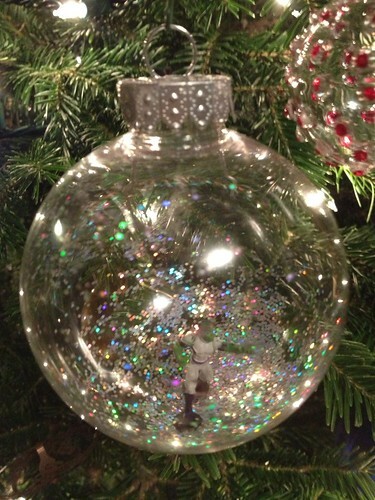 Clear plastic ornaments can be purchased am most craft stores (our local is a Michael's). Some figures, some glitter, and what emerges is pure magic. Extra long tweezers are especially helpful in placing the figures...and depending the base and the glue you are working with, get ready to exercise patience. Think ship in a bottle level patience. The coolest thing about this is that the glitter is just in there, held down by gravity and dispersed by static, so you can still shake it and let Beast Boy live his Studio 54 dreams over and over again. And not to be outdone, The Gargoyle, Issac, attempts to put a star on a tree. 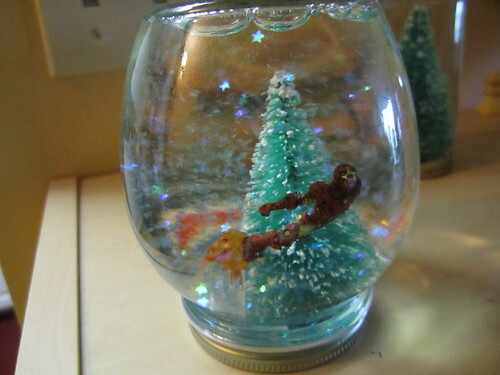 So yeah, this craft was a huge hit. Some of the finished projects even became prizes in The Red Menace's annual cookie decorating contest. Humble Brag: I won first place in the "best use of shape" category (I turned a leaf cookie in to a t-bone steak) . And Disco Beast Boy is now on my tree. Ladies of Comicazi PSA: For more information about Glitter Lung, check out this article. Stay safe and make sure you recognize the signs! Glitter lung is not just for kindergarten teachers anymore.